This report was prepared to provide a baseline for soil health work within the former DPI with respect to the use of terminology, a general understanding of soil health within agro-ecosystems and some frameworks that can be used in future work. Soil health is an essential aspect of environmental health as it supports a range of ecosystem services. This is a complex topic and there is a wealth of literature on soil health and soil quality but terminology and definitions sometimes differ and therefore waylay the unwary reader. The focus is particularly soil health for agriculture, but the implications of soil health for environmental health and for provision of ecosystem services are also discussed. The international context for soil health has been summarised with key references provided. Priorities for soil health are presented through a general framework that is used in landscape research and decision making. Appendices comprise a case study in extension for soil health in NE Victoria, a review of the use of remote sensing in soil health assessment, and a review of the biological aspects of soil health and research needed for soil biology. This report should be used as the primary reference for terminology and frameworks for soil health in the former DPI Soil Health for Sustainable and Productive Landscapes project. This report was produced in 2009 for the Soil Health for Sustainable and Productive Landscapes project as part of the ‘Our Environment, Our Future – Sustainability Action Statement’ by the Department of Primary Industries Victoria. The report provides a summary of tools that are currently used to assess soil condition or soil health at the farm or paddock scale. The report is a simple inventory with some commentary. The report provides an overview of key subject areas, references cited, and a collection of appendices containing tabular summaries of individual tools, tests and methods. The lead author was Richard MacEwan of the Future Farming Systems Research Division. 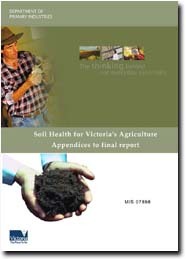 This report was produced in 2007 for the Soil Health for Sustainable and Productive Landscapes project as part of the ‘Our Environment, Our Future – Sustainability Action Statement’ by the former Department of Primary Industries Victoria. The lead author was Melissa Cann of the Farm Services Victoria Division. The report details assessment tools, programs/learning guides, brochures/booklets, information notes, educational manuals, departmental videos, and posters. 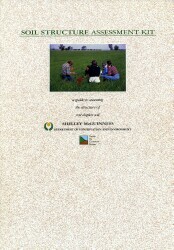 This report was produced in 2009 by Richard MacEwan (Future Farming Systems Research Division) through the Soil Health for Sustainable and Productive Landscapes project as part of the ‘Our Environment, Our Future – Sustainability Action Statement’ by the former Department of Primary Industries Victoria. This report documents the Soil Health Management Plan concept and proposes a process for implementation based on progress with the pilot group to date. These one to two page documents were produced through the Soil Health for Sustainable and Productive Landscapes project as part of the ‘Our Environment, Our Future – Sustainability Action Statement’ by the former Department of Primary Industries Victoria. 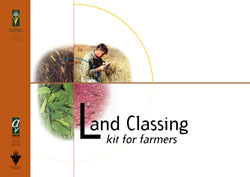 The Practical Notes and Quick Reference Guides were developed to support the training workshops delivered to land managers and advisers throughout the project. 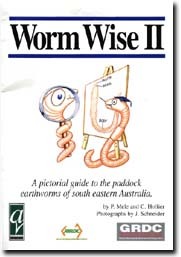 This booklet was produced as part of the earthworm research programs funded by the former Agriculture Victoria, (Rutherglen Centre), and the Grains Research and Development Corporation (GRDC). It acknowledges the input of many of the staff at the Rutherglen Centre, and particularly the editorial comment of Jeff Hirth. The booklet is designed to help you easily recognise the earthworms that you are most likely to encounter in your paddocks and gardens. It will also help you estimate the numbers of earthworms living in your paddocks and provide a picture of the general "health" of your soil and the potential to improve it. The inevitable changes in climate resulting from the 'greenhouse effect' are expected to have a major impact Victoria's agricultural sector and public lands. The economic viability and environmental amenity of these sectors depends heavily on 'soil health'. This report was commissioned to develop a better understanding of the likely impact of climate change on Victoria's soil resource. It also makes some recommendations on management to maximise preservation of soil health amid climate change. These booklets were prepared by the former Department of Agriculture and Rural Affairs in 1990 as part of a former National Soil Conservation Program (NSCP) funded project. 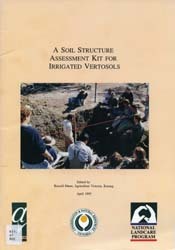 The booklets aim to provide a basic understanding of aspects of soil structure, monitoring & managing acid soils and dryland salinity; and form part of a package that included supporting videos. 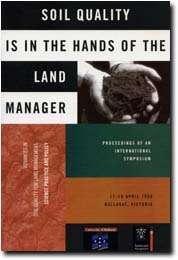 International Symposium: 'Advances in Soil Quality for Land Management: Science, Practice and Policy' held at the University of Ballarat, 17-19 April 1996. The symposium was jointly organised by the University of Ballarat and the Cooperative Research Centre for Soil and Land Management (Adelaide). Sponsors were LWRRDC, HRDC, DRDC, RIRDC, Alcoa, Pivot, McCain Foods, City of Ballarat and Central Highlands Water. 150 delegates (including 25 UB students) attended the symposium. 23 invited oral papers were delivered and 33 posters submitted. Ten of the oral presentations were given by overseas scientists: John Doran, Francis Pierce, Lee Norfleet (USA), Ed Gregorich, Martin Carter, Bev Kay (Canada), Graham Sparling, David Horne (New Zealand), Art Gomez (Phillipines) and Stephen Nortcliff (UK).